Bahrain with its capital Manama is located in Asia (Middle East, archipelago in the Persian Gulf). It covers some 761 square kilometers (3.5 times the size of Washington, DC) with 1,410,940 citizens. Arabic, English, Persian and Urdu are the common languages used in Bahrain (consider regional differences). Thiscountry has no land-based border with any other country. The Kingdom of Bahrain is a Middle Eastern archipelago in the Persian Gulf, tucked into a pocket of the sea flanked by Saudi Arabia and Qatar. The best time to visit Bahrain is November-March, with October & April being just bearable. Be sure to take along a sweater during December-March as evenings can be cool. Bahrain has history dating back 5000 years, from the ancient Dilmun period through the Islamic era. The country offers three forts which have been meticulously restored and opened to the public, although a lack of signs and general promotion by the country's tourist industry sometimes makes finding these sites difficult. The Qala'at al-Bahrain (Bahrain Fort) is sightseeing must and located off the northern shore, five to ten minute drive away from Manama city. Do not travel to Bahrain during the annual F1 race in April if looking for reasonable prices, as hotels will quadruple their rates. To reach someone Bahrain dial +973 prior to a number. The local cellular networks are operated on 900 MHz, 1800 MHz, 3G, 4G. Websites typically end with the top level domain ".bh". If you want to bring electric appliances (e.g. battery chaarger), keep in min the local 230 V - 50 Hz (plugs: G). The sign for the locally used currency Dinar is BHD. Red, the traditional color for flags of Persian Gulf states, with a white serrated band (five white points) on the hoist side; the five points represent the five pillars of Islam. 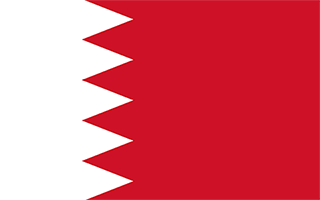 In 1783, the Sunni Al-Khalifa family took power in Bahrain. In order to secure these holdings, it entered into a series of treaties with the UK during the 19th century that made Bahrain a British protectorate. The archipelago attained its independence in 1971. A steady decline in oil production and reserves since 1970 prompted Bahrain to take steps to diversify its economy, in the process developing successful petroleum processing and refining, aluminum production, and hospitality and retail sectors, and also to become a leading regional banking center, especially with respect to Islamic finance. Bahrain's small size, central location among Gulf countries, and proximity to Iran require it to play a delicate balancing act in foreign affairs among its larger neighbors. The Sunni-led government has long struggled to manage relations with its large Shia-majority population. In early 2011, amid Arab uprisings elsewhere in the region, the Bahraini Government confronted similar pro-democracy and reform protests at home with police and military action, including deploying Gulf Cooperation Council security forces to Bahrain. Political talks throughout 2014 between the government and opposition and loyalist political groups failed to reach an agreement, prompting opposition political societies to boycott parliamentary and municipal council elections in late 2014. Ongoing dissatisfaction with the political status quo continues to factor into sporadic clashes between demonstrators and security forces.